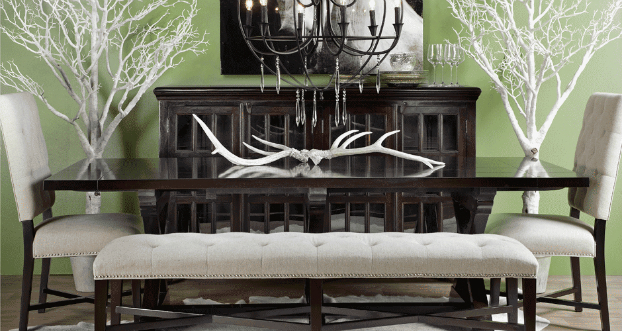 If you need fresh inspiration and ideas to decorate and makeover your dining area, you should take a close look at these 12 dining room ideas by Z gallerie. You’ll definitely find a couple of new ideas that will add comfort and style to your dining room. Here’s a chic and cozy dining room. A bench and two elegant upholstered chairs surround the dark brown dining table. The unique golden bonsai tree decoration stands out on the table. Rectangular gold serving dishes form a bold contrast to the black onyx stemware. If you love animal decorations, you’ll like to eat in this dining room. The white animal decorations blend beautifully with the white wall. One axis dining table made of tinted glass and metallic legs is surrounded by six axis chairs. A low chandelier provides nice romantic lighting while a zebra rug provides extra comfort underneath the table. This classic design consists of a round “washed” oak dining table with 6 dining chairs. Four of the chairs have white painted legs that give a nice contrast to the beautifully patterned brown rug. 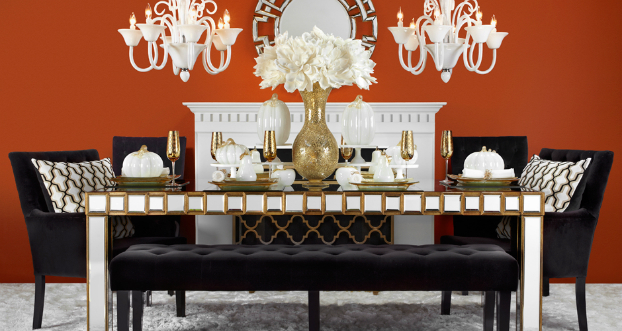 This elegant dining area has a mirrored dining table plated with gold. Two chocolate arm chairs and side chairs add luxurious comfort. The big white pillows and white rug give a brilliant contrast to the dark brown chairs. Gold colored barware and stemware make the table look classy. A comfortable long bench provides extra seating space. This heavily decorated dining table contains several artifacts, carvings and sculptures from different continents – a truly global garden. All the chairs are covered with pearl colored upholstery for comfort and style. The chic round glass table creates an intimate dining area. It’s a great dining space – just for you and your spouse. Four chairs with chocolate upholstery add elegance to the table. The beautiful chandelier and three pillar holders provide subtle lighting. A blend of gold, brown and white makes this design look romantic and vibrant. Here’s a blend of contemporary and antique designs. The tinted glass table and the white chairs add flair to the bold black and white theme. The black rug, chandelier and onyx stemware form a sharp contrast to the white drawer chest and ivory colored aspen trees. This dining room design reminds you of a cottage home. The oak wood table is surrounded by four comfortable dining chairs with natural pearl colored upholstery. It has an elegant chandelier. The brilliant white curtain and silverware provide a nice contrast to the dining table. Here’s a dining space with a refreshing organic look – a lovely place to have dinner. The dark polished wooden table, the pearl colored linen upholstered chairs and the mint green carpet make you feel like you are in the midst of a garden. Two ivory colored aspen trees and a globe shaped chandelier add brilliance and elegance. This is a radiant dining space with an attractive mirrored table combined with pearl upholstered seats. 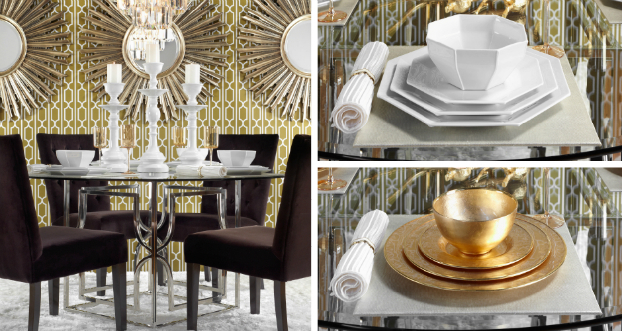 The beautiful chandelier and golden dinnerware add a touch of luxury and style. The choice of rug and wall paintings depicts artistic brilliance. If you like luxurious dining areas, you’ll like this design. The mirror colored dining table and side table will instantly attract you. You can seat on one of the comfortable chocolate colored chairs to have a delicious evening meal. The beautiful chandelier and two hanging mirrors give unique lighting effects while the platinum rug offers extra comfort. The shades of blue chosen for this design provide a soothing effect on your eyes. Venetian blue dining chairs surround the round oak table. Aquamarine pillar holders and the canvas paintings blend with the blue wall to create a calm and relaxing atmosphere. Did any of these designs inspire you? If you were to choose just one design, which one will you choose? Why? Kindly share your views about these designs in your comments. Thanks.